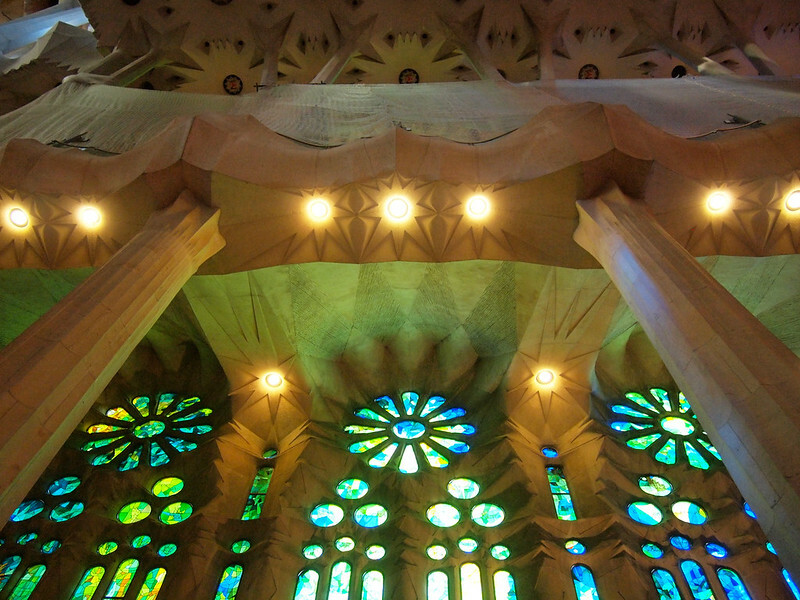 Once upon a time, a man named Antoni Gaudi decided he wanted to build a church. But this wouldn't be just any church. No, this church would have gnarled towers and towering stained glass windows and giant turtles would hold up its pillars. In short, this would be unlike any other church anywhere in the world. 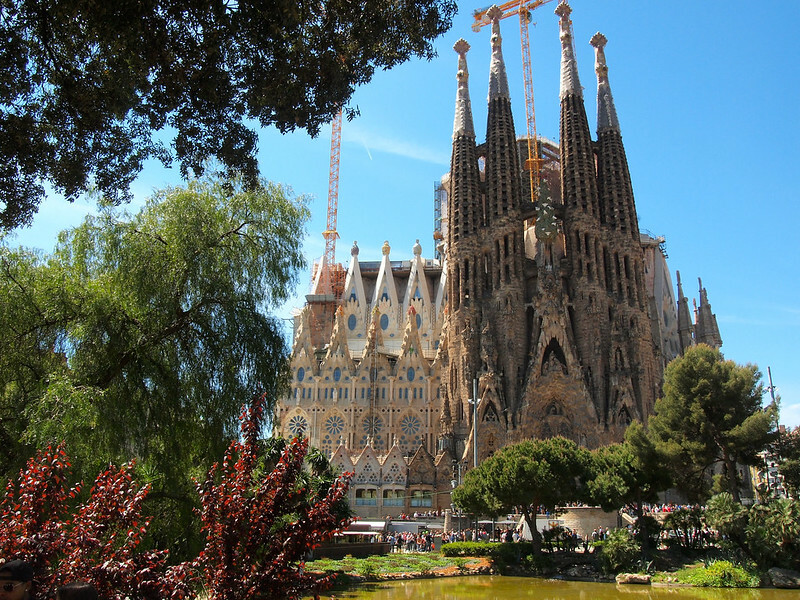 In 1883, Gaudi, Barcelona's foremost and possibly most creative modernist architect, got involved in work on the Sagrada Familia (or, more correctly, Basílica i Temple Expiatori de la Sagrada Família). He dedicated the rest of his life to the design and construction of this Roman Catholic masterpiece – to the point where he spent the last couple of decades of his life living in the church's crypt. 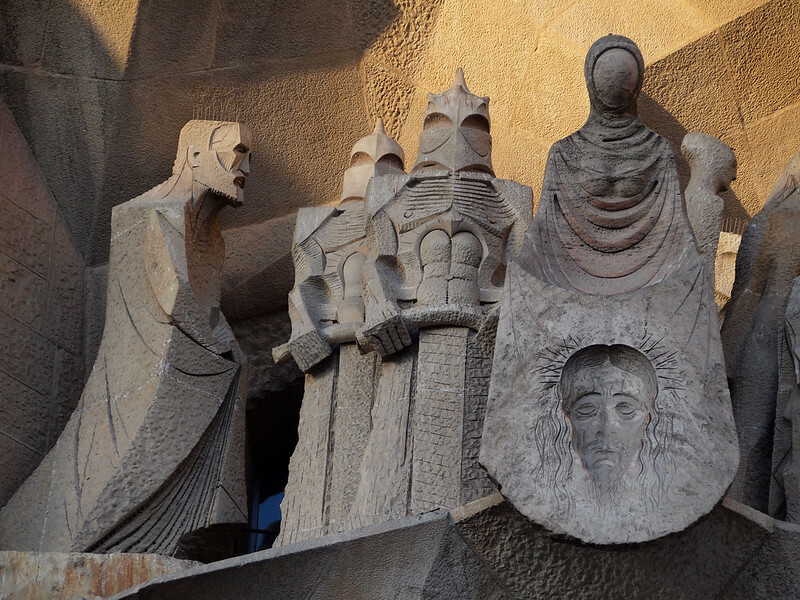 Gaudi had always been a religious man, but many say his obsession with the Sagrada Familia made him go a little mad. He worked on the church for more than 40 years before he died tragically in 1926 from injuries suffered in a tram accident. The church wasn't even 25% complete. Today, nearly 90 years later, the church STILL isn't complete. 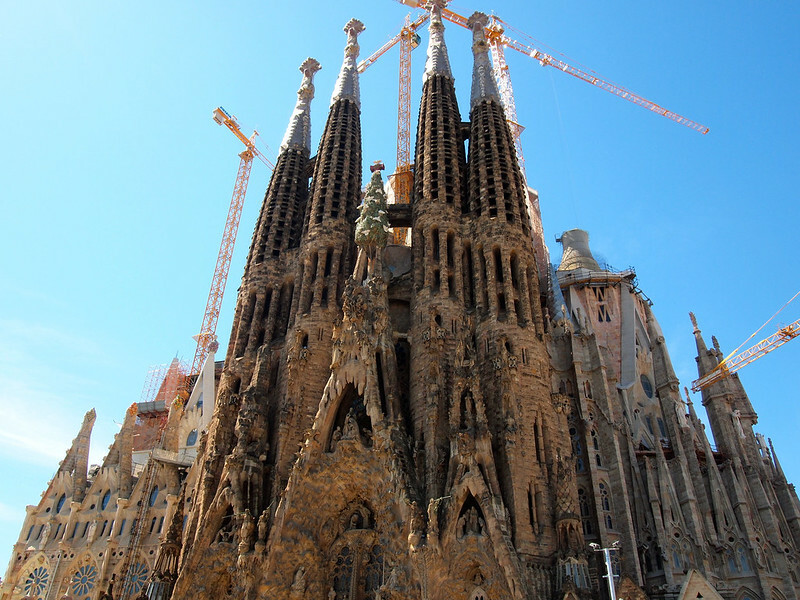 Crews have been working off Gaudi's original designs ever since his death, but progress is slow. After all, it's kind of hard to follow in the footsteps of one of the world's most creative (and perhaps a little crazy) architects. 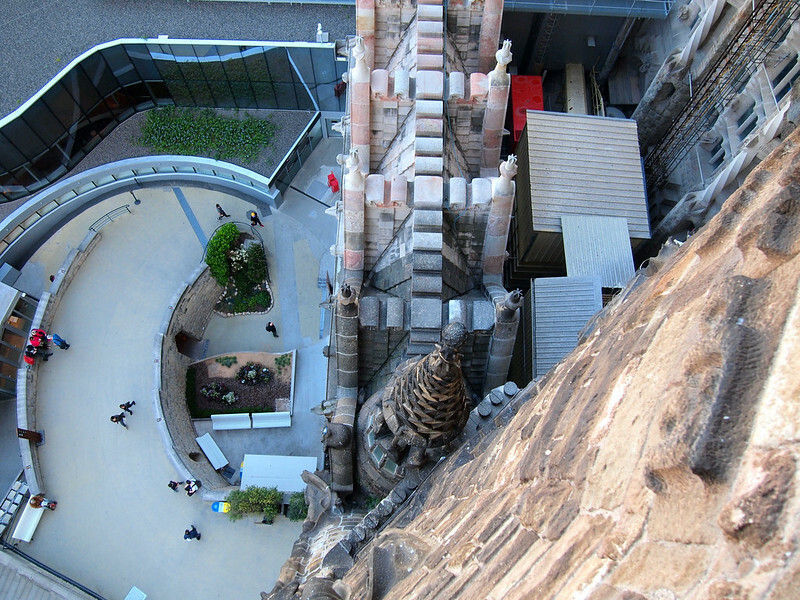 When you first see the Sagrada Familia from the outside (and, really, if you're in the area you really can't miss it), the first thing that will strike you is probably its odd exterior – and how it looks entirely different depending on which side you're looking at. The church currently has two facades – the Nativity Facade and the Passion Facade. 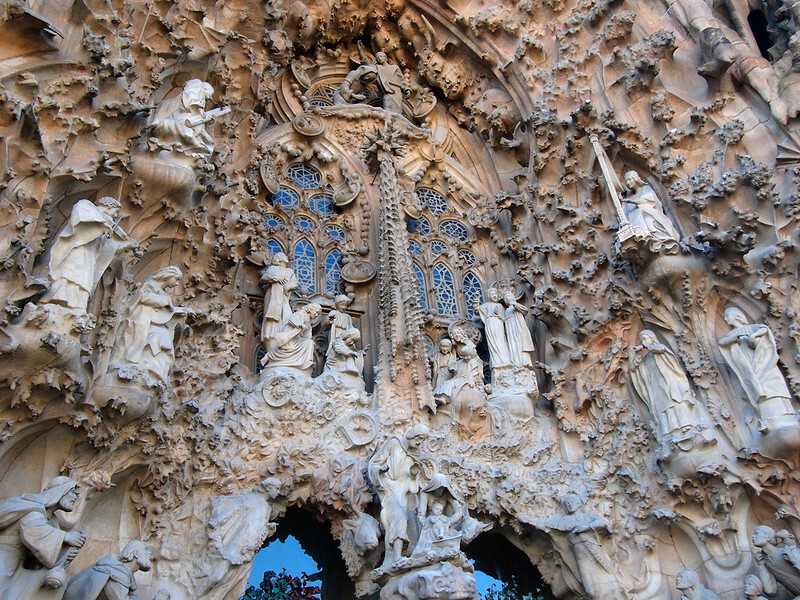 The Nativity Facade was completed by Gaudi himself, in a typically unique (AKA really freaking weird) style. From afar, it just looks really bumpy. But up close, it's almost like it's melting or perhaps made out of mud. 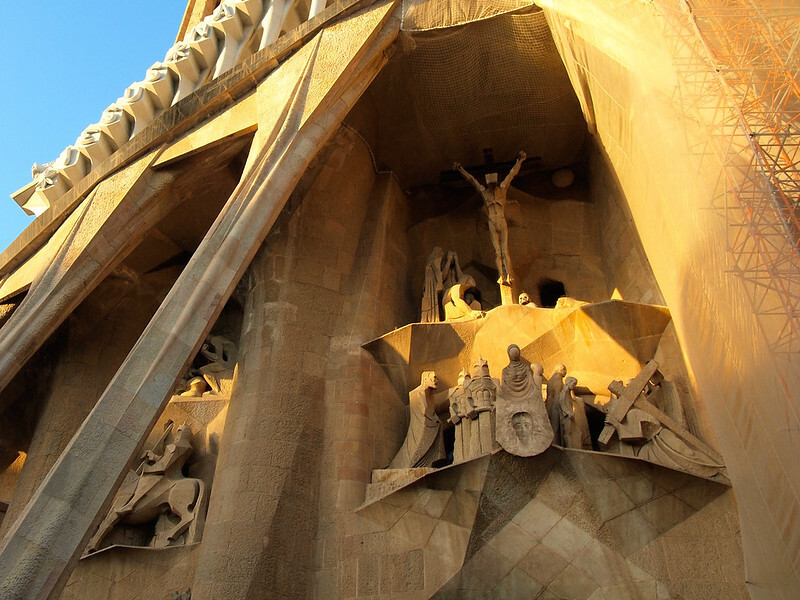 Walk around to the Passion Facade, however (which is still being worked on), and you'll see a completely different style of architecture, characterized by very straight lines and sharp angles. That's supposed to be Gaudi there on the far left! Inside, however? 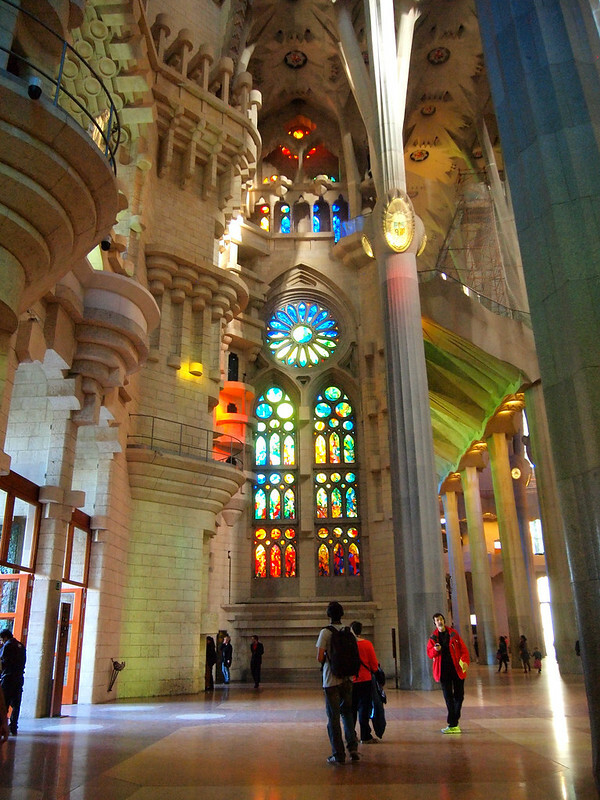 The inside of the Sagrada Familia is nothing short of incredible. The first thing you'll notice when you walk inside is the sheer HEIGHT of the ceilings inside the nave. Massive pillars stretch from floor to ceiling, absolutely dwarfing every human inside. 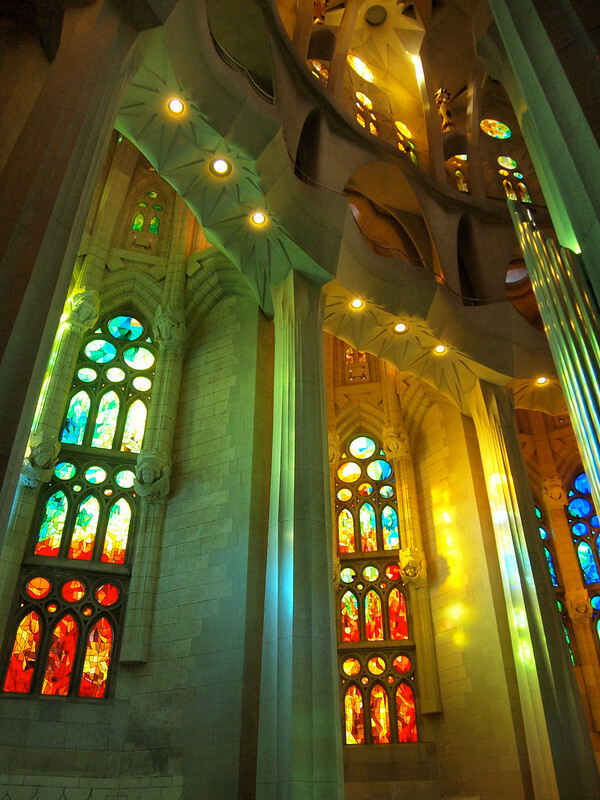 On two of the main outer walls, ginormous stained glass windows paint the church's interior in different shades of greens, blues, reds, and yellows. 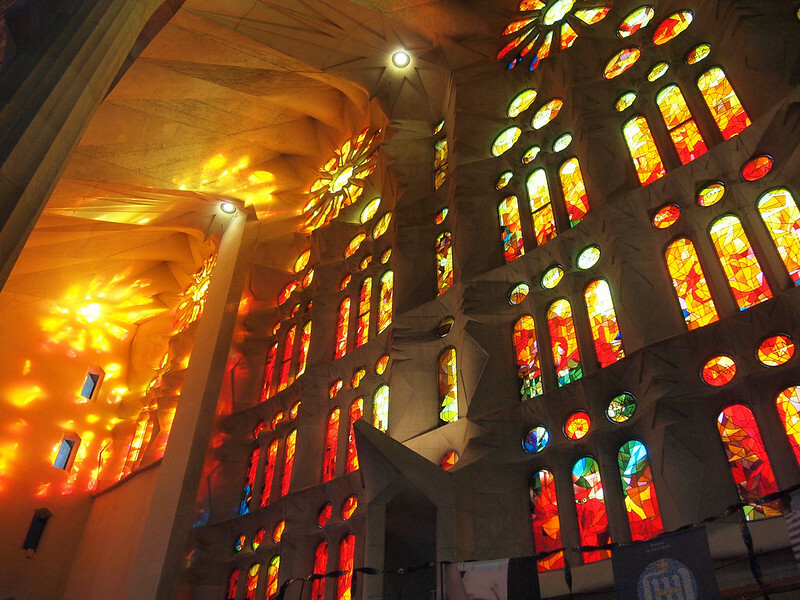 I visited in the early evening, when the sun was streaming in through the red and yellow windows, making the inside of the church look like it was on fire. 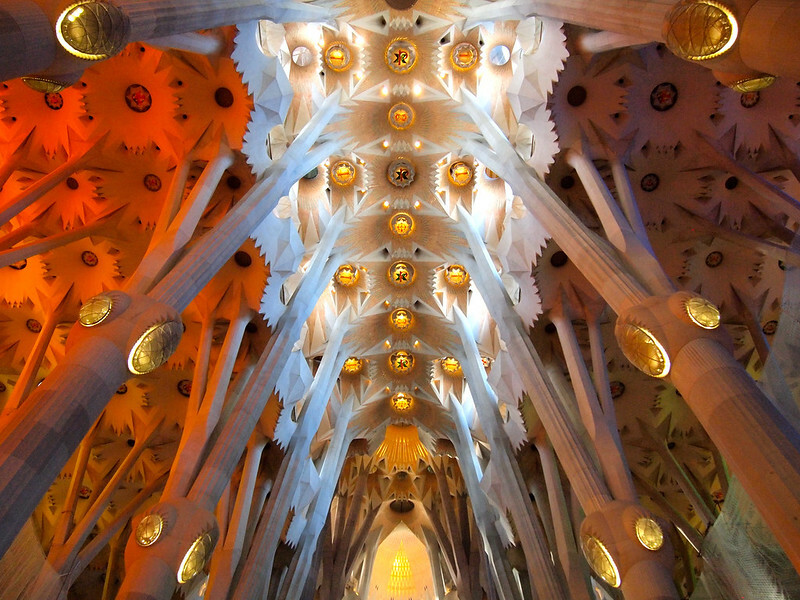 Very rarely am I speechless about a place, but the inside of the Sagrada Familia came pretty close to rendering me unable to form coherent thoughts as I roamed around, slack-jawed, completely awed by the beauty in this architecture. I spent at least an hour in the interior of the church, walking circles and noticing new intricate details on each lap. 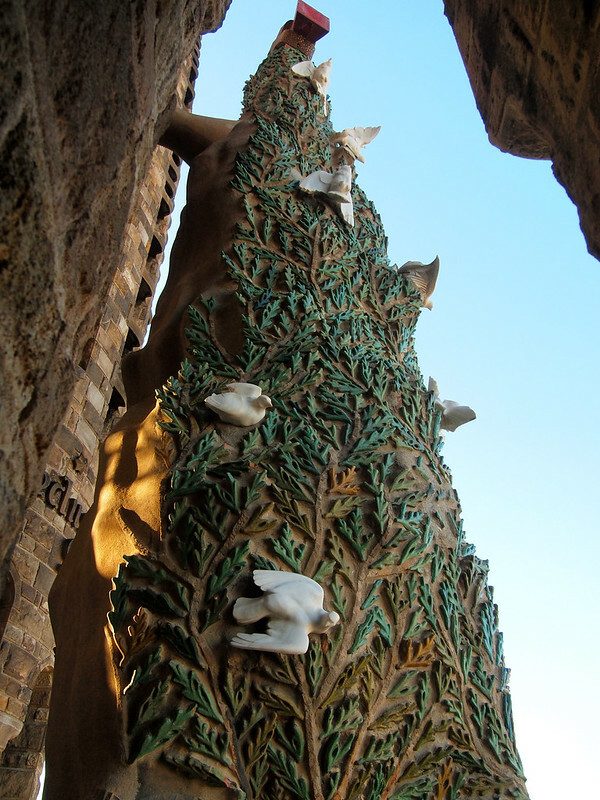 Eventually, though, it was time to head to the towers on the Nativity Facade side of the church – I was going up. 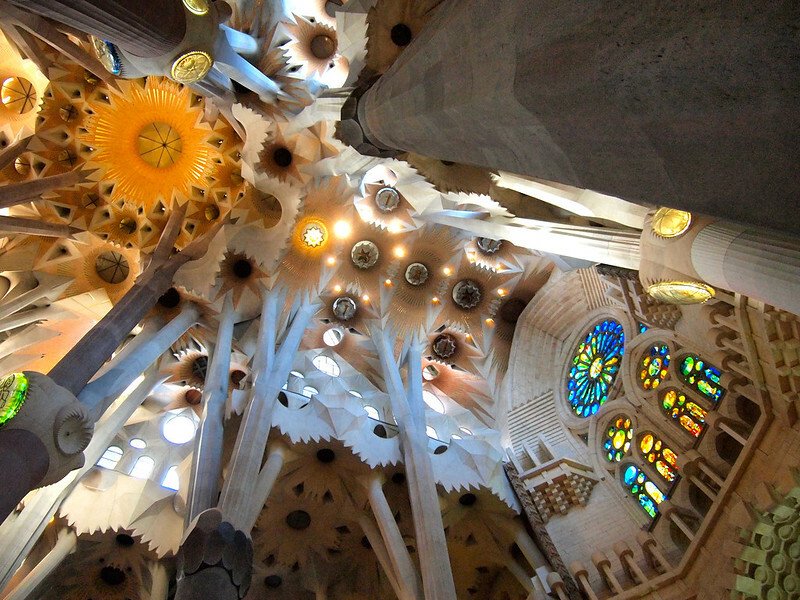 The original design of the Sagrada Familia calls for 18 towers in total. 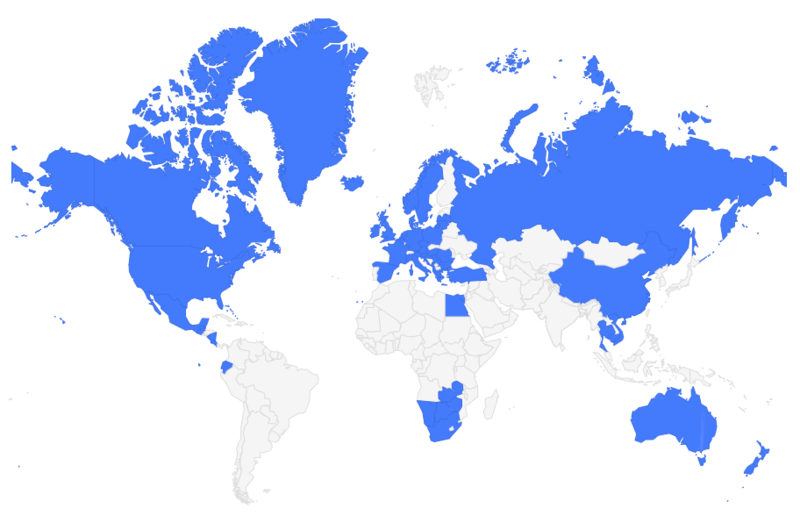 At present, there are only 8. But, on most days, you can buy tickets to go up into some of them. I chose to visit the Nativity Facade simply because those were the towers with availability when I pre-booked my ticket online. Tower visits are regulated, and often sell out by the end of the day. View from partway up a tower, looking down. 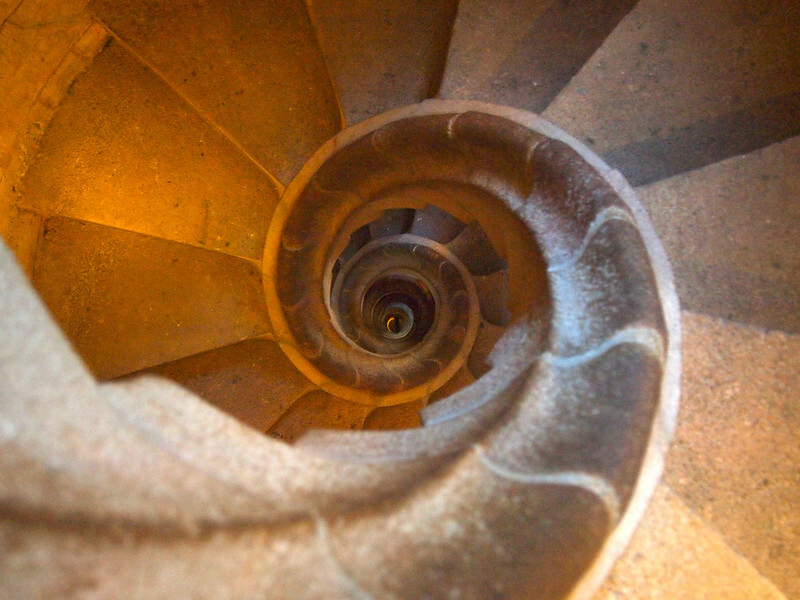 Going up included a quick elevator ride, some time to take in the view out over Barcelona, and then a walk down a series of dizzying spiral staircases to get back to the main part of the church. For and extra 4.5 Euro, I thought this was definitely worth it. 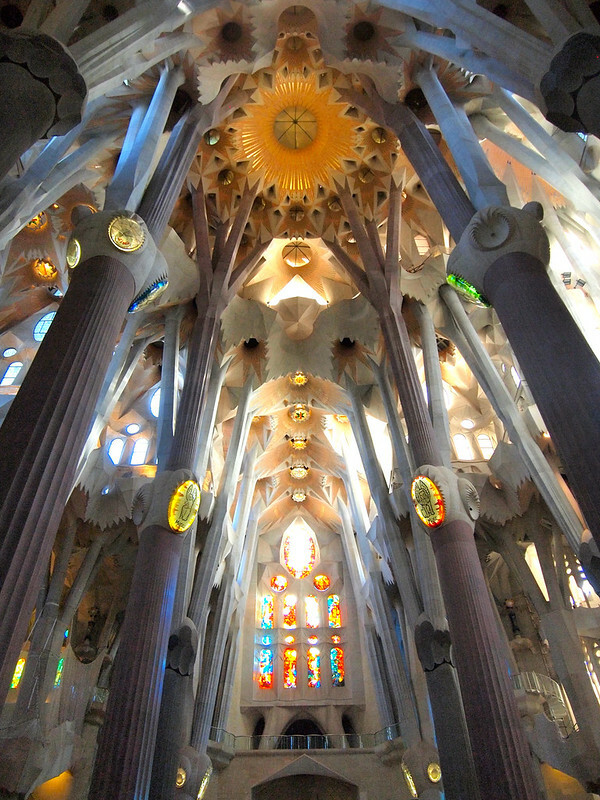 It gave a completely different perspective of the church, and allowed you to get up-close with some of the architecture that Gaudi himself executed. 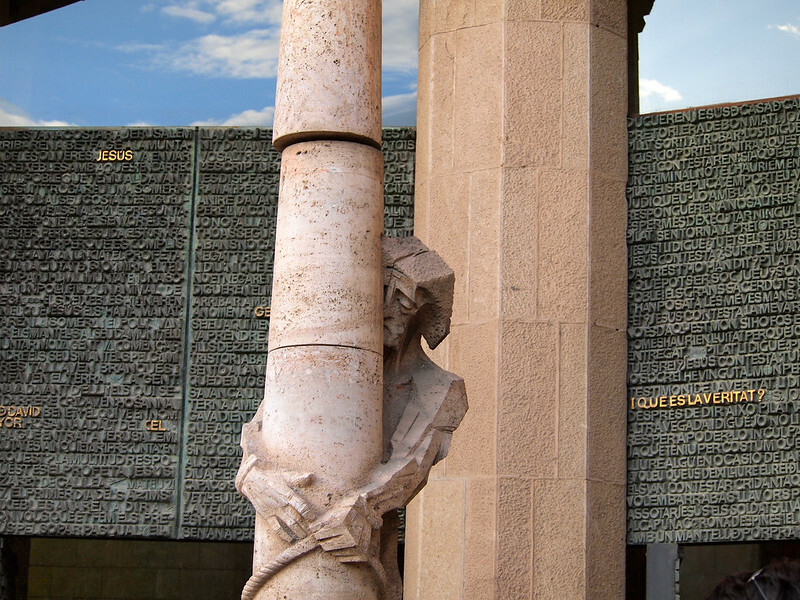 My last stop in Sagrada Familia was the Schools building. 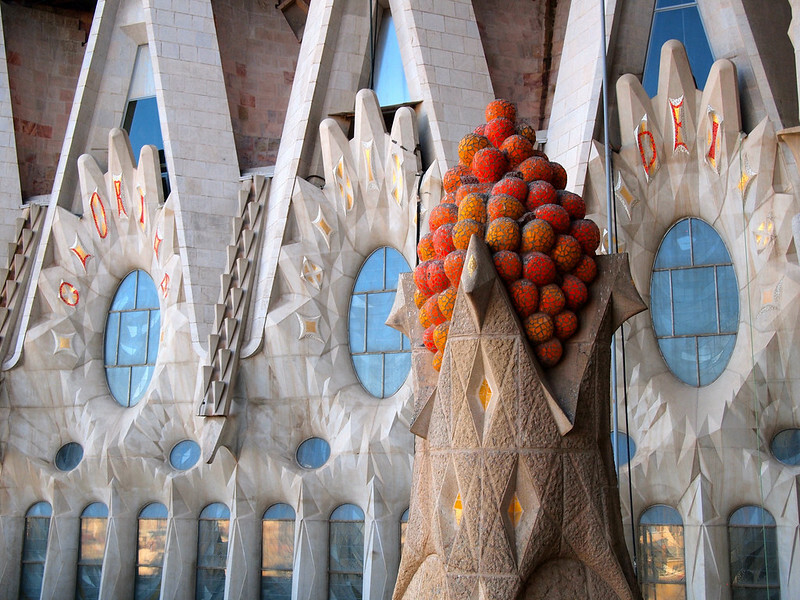 This was a school originally designed by Gaudi in 1909 for the children of the church's construction workers. 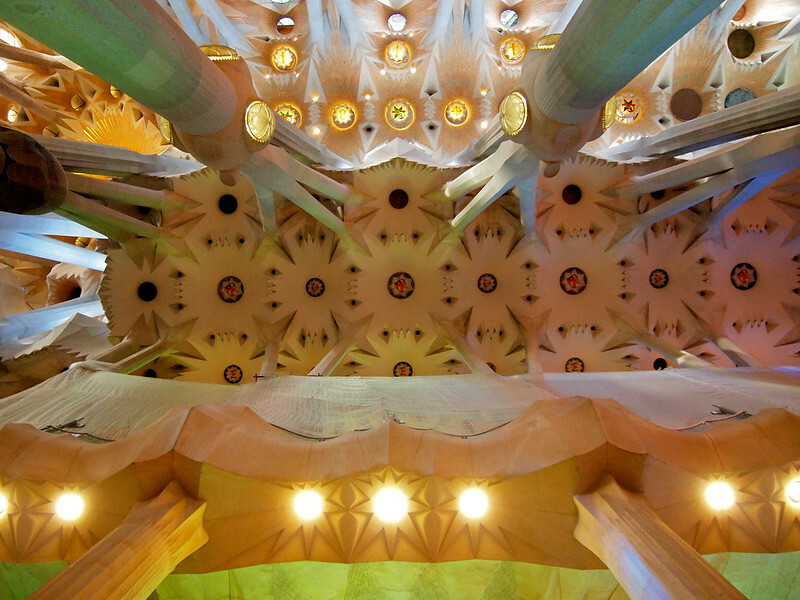 Today, the building now houses an exhibition about the history of Sagrada Familia and Gaudi's designs. I spent more than two hours total inside Sagrada Familia, and it was only the fact that it was closing time that convinced me to leave. 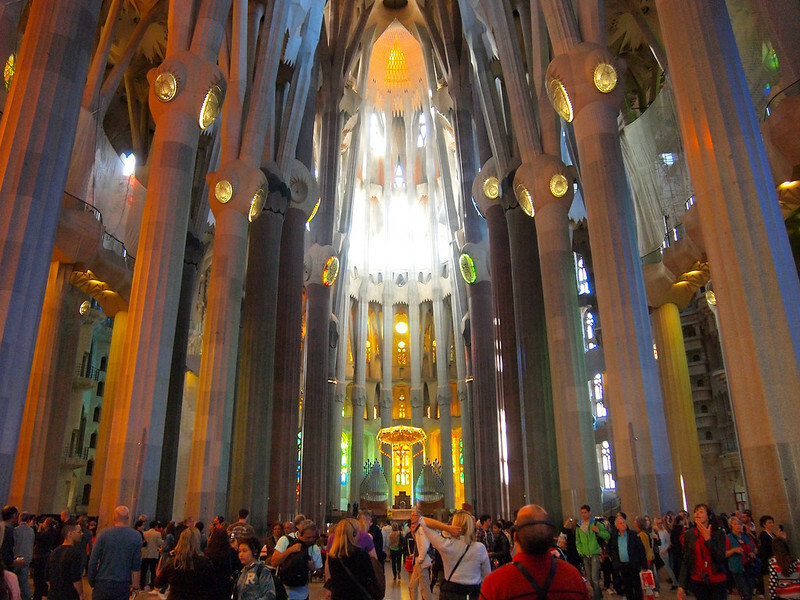 No matter how many churches, cathedrals, and basilicas you've seen throughout Europe and the rest of the world, I promise that you have never seen one like the Sagrada Familia. 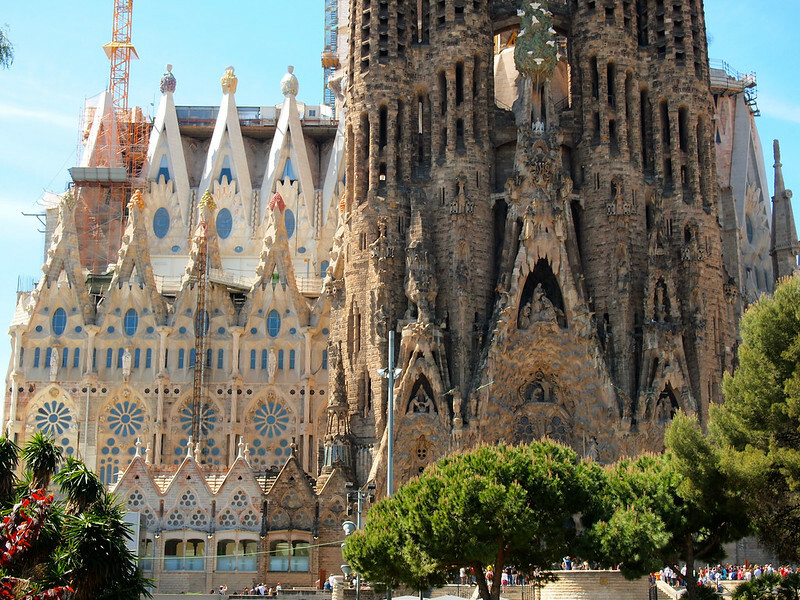 It's definitely a must-see in Barcelona! TIP: Lines to buy tickets at Sagrada Familia can be really long. Book a ahead of time, which lets you skip the line and just show up at your appointed time. This is what I did, and it was quick and painless! You can just show your ticket on your smartphone when you get there. 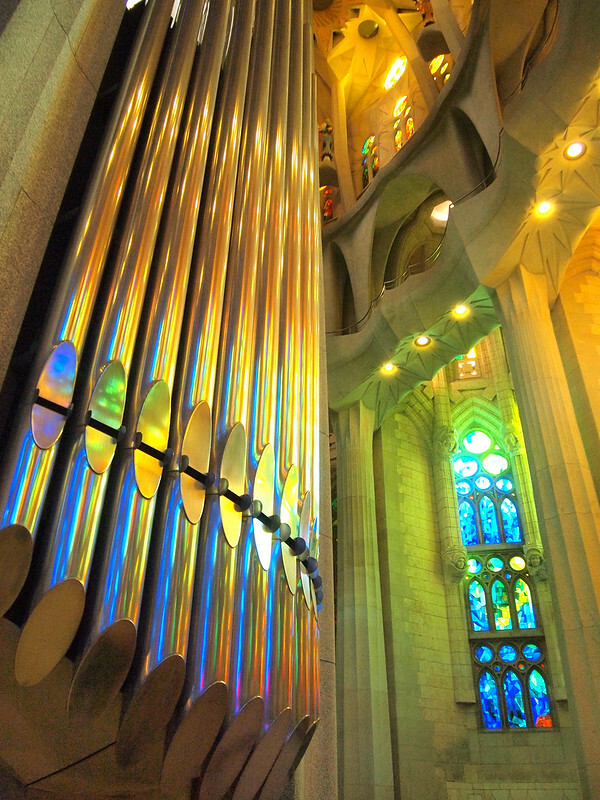 Have YOU ever been to the Sagrada Familia? If not, would you go? It really is a spectacular site! This post makes me want to go back! I’ll definitely have to go back in 10-15 years, when they’re hoping to have it finished! Seeing this post makes me want to Barcelona again. I totally agree with you, the outside is not very pretty, but when we enter… it feels like we are dreaming. How can this possibly be a real church? I KNOW! That’s exactly how I felt too! It really is. Incredible to think that one dude thought it all up! I had a similar feeling about the inside vs the outside. The outside looks to me like it was made by someone pouring wet sand through their hand. The inside? It’s spectacular! Glad I’m not the only one who thinks the outside looks a bit weird! Now, of course, it might end up looking completely different when it’s finished! It is an amazing building! I kind of agree with you on the outside vs inside, though. I hadn’t seen that turtle detail before either, it’s the best! 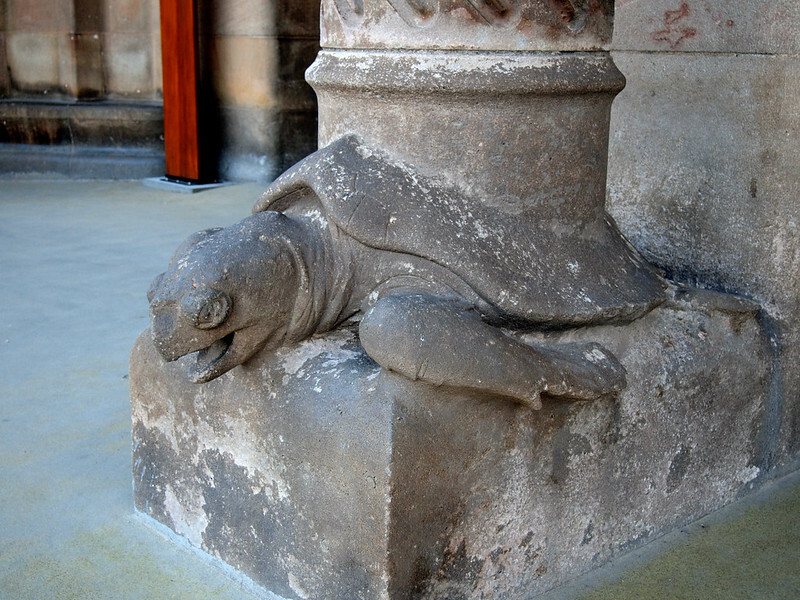 Haha I think the turtle was my favorite part of the exterior! SO many details to notice. Wow! Incredible photos,great text.Are your photos available for purchase? I’ve been to the church but it was about 10 years ago.Your photos are the best I’ve ever seen. Thanks for sharing them. Aww thanks Bruce! I’m glad you liked the photos. I don’t have any of these for sale anywhere, but if you email me (akatuki5.info), maybe we can work something out! I hadn’t been to Spain until this year, either. Which is kind of crazy! I LOVED the couple of weeks I spent there, and definitely will be back! Spain has been calling to me for so long! 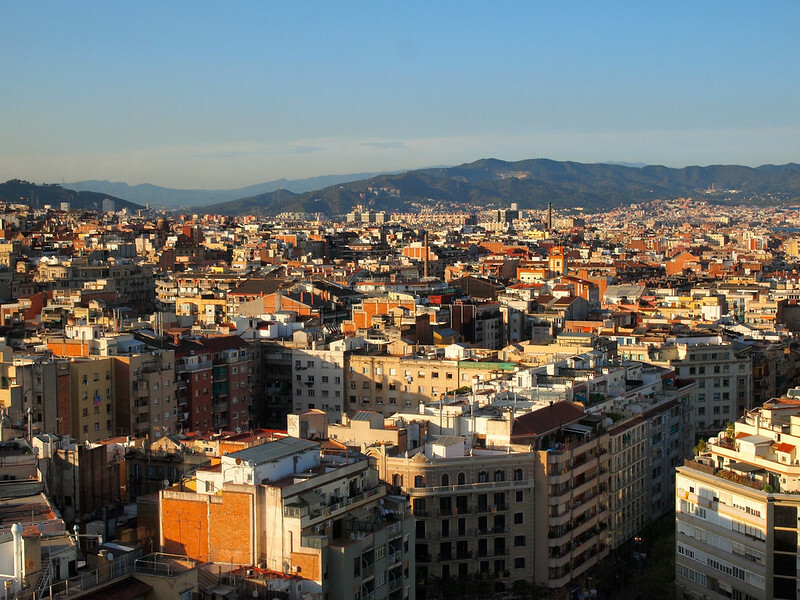 Can’t wait to explore Barcelona in February! I hope you enjoy it as much as I did, Britt! I would say it’s one of my favorite cities in Europe now! Love love love Sagrada Familia! Great photos btw. They have definitely gotten a lot done since I was there over 6 years ago. Hopefully soon I will be able to go back and see the progress in person. I can’t wait to see it when it’s all finished! I’m relieved to know that I’m not the only person who thinks the outside of this church is really freaking ugly. LOL! But talk about beauty coming from the inside – wow! The windows and light play are amazing! That’s so amazing! I visited Sagrada ~5 years ago and I can see that progress has been made since then! The stained glass windows were all up but the floor was definitely still dusty and not tiled. Plus most parts of the church were closed to visitors due to the work still being done in its interior. I agree with you on the exterior though – I think both sides look rather hideous!! Glad I’m not the only one who feels that way about the outside! But yeah… the inside is incredible now! Those windows are just WOW. Those pictures were so beautiful. I really want to see that church in person someday. It’s definitely worth the entry price – so stunning! Really fabulous photographs Akatuki. They do you proud. I’ve been to Barcelona many times and I try to go to the Sagrada Familia as much as I can, as the cathedral is always having bits added on. I doubt that it would ever be completed as it’s been in construction for more than 100 years LOL! 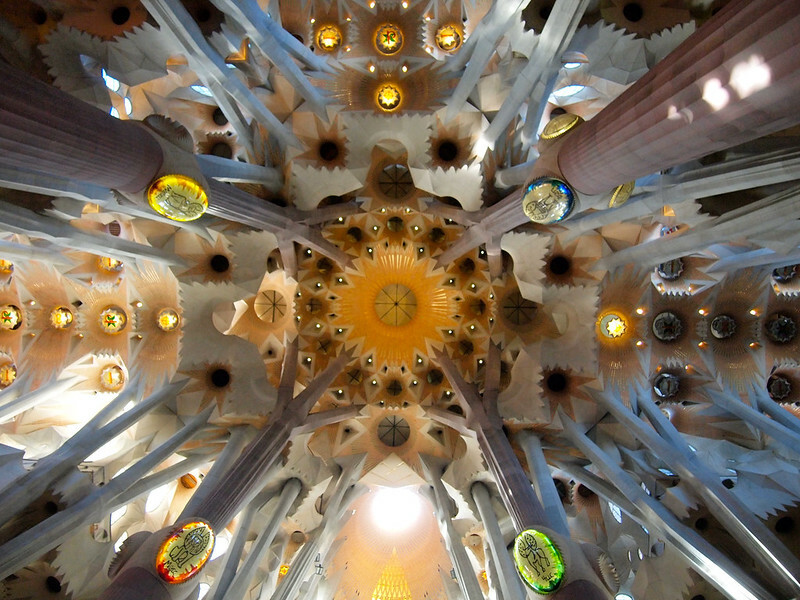 I went to Barcelona for TBEX and my time was extremely short so I only went to one Gaudi building in a suburb that I hadn’t previously been in! It definitely seems like the construction project that will never end! I hope they finish it in my lifetime, though – I’d love to see it when it’s all done! Love this post! 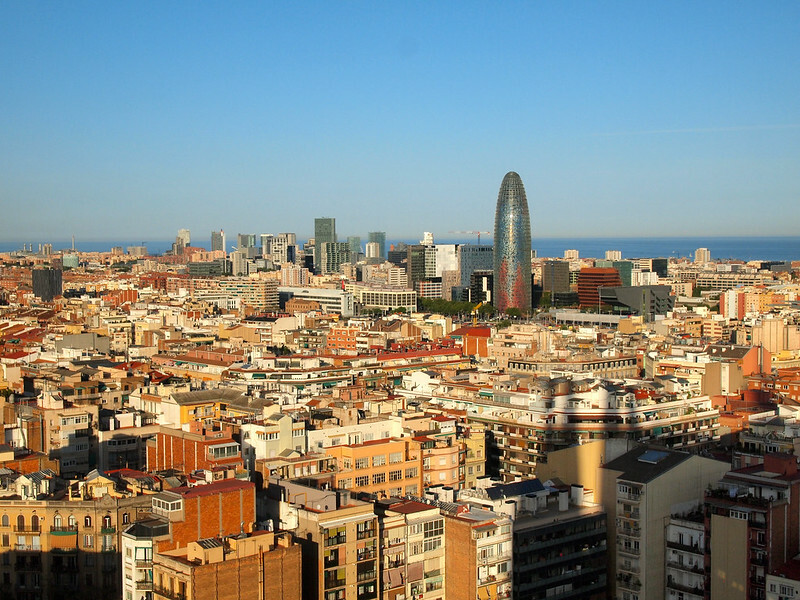 We are booked for Barcelona next year and we are even more excited to go. 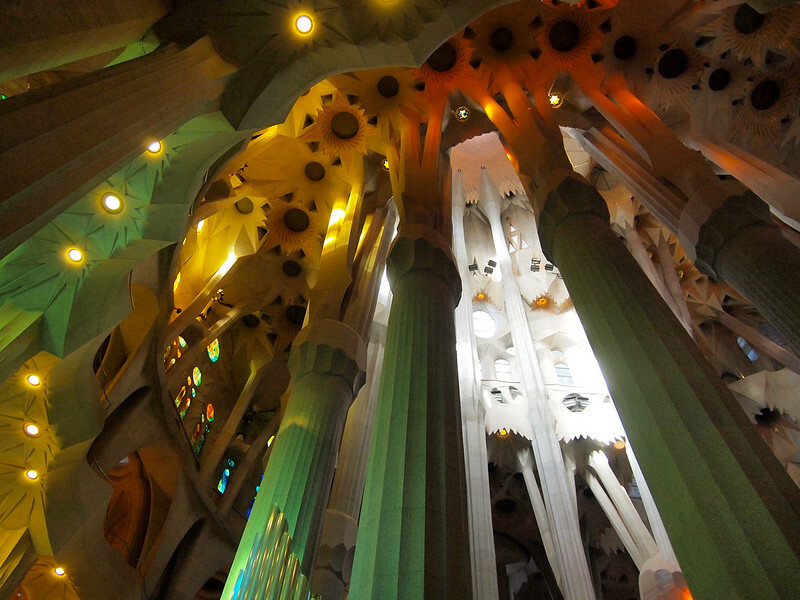 Loved my visit to the Sagrada Familia. I wonder if the construction is ever going to end.. believe it’s been under construction for almost 100 years? More than 100 years! They have a goal of finishing it by 2026 (100 years since the death of Guadi), but who knows if they’ll make it or not! That is definitely some interesting architecture! Brilliant artist and his mind is very creative.Magnificent. Hi..Enjoying your photos of Barcelona and specially the SF, I went there in May 2015 too and agree that man Gaudi is absolutely a genius. 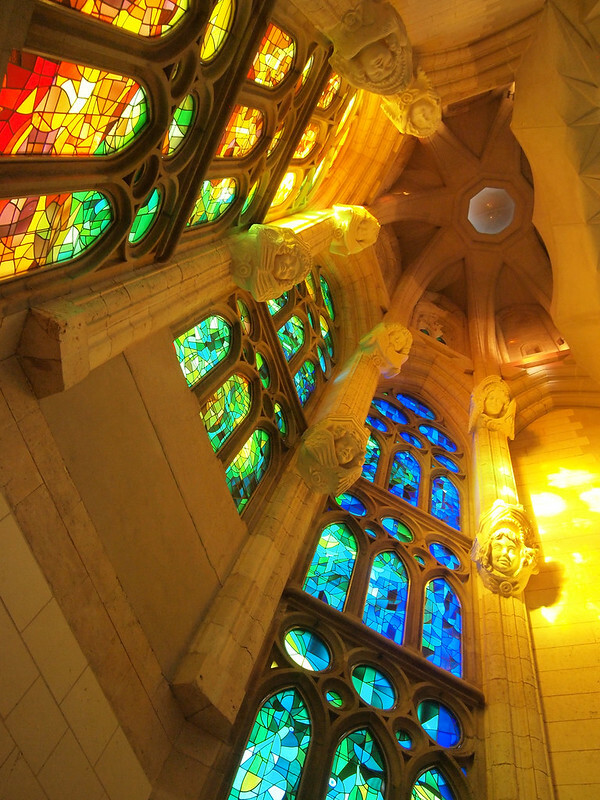 Just wanted to add, that it seems Gaudi envisioned bringing the normal insides of churches to the outside, and the natural outside to the inside i.e. statues and relics on the outside and the grove of trees inside. What a truly unique representation. It certainly is unlike any other church, isn’t it? I know I’ll have to go back once it’s finally finished! 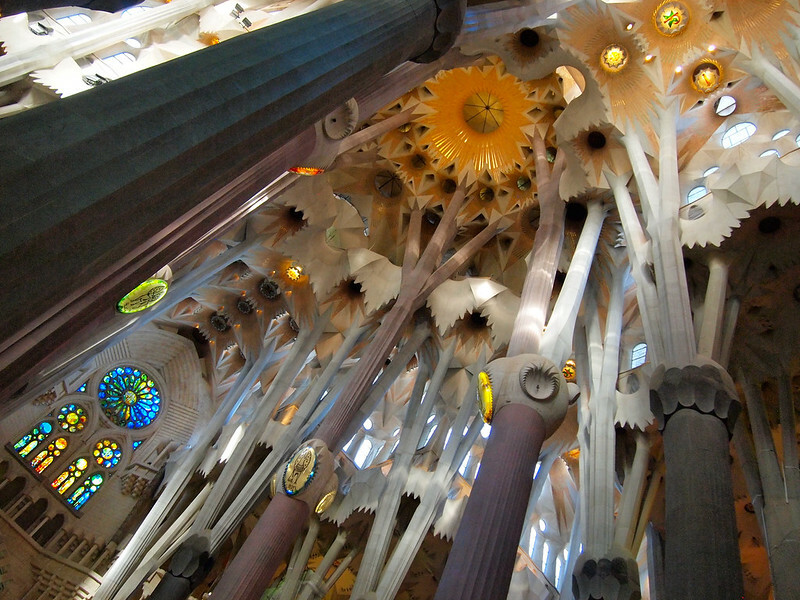 Gaudi obviously had an extraordinary imagination. I have been there 7 years before and the construction was as always going on. Your photos reminded me of my great journey to Spain. You indoor photos are excellent. They are so bright and so rich in colour. Thank you for this visual feast. Thank you! And yes, he certainly had a mind on him, didn’t he? Construction is going to continue for years more, but I hope to see the church finished sometime in my lifetime! Breathtaking! Bucket list visit, for sure! Yes! If it’s not on your list yet, definitely add it ASAP! 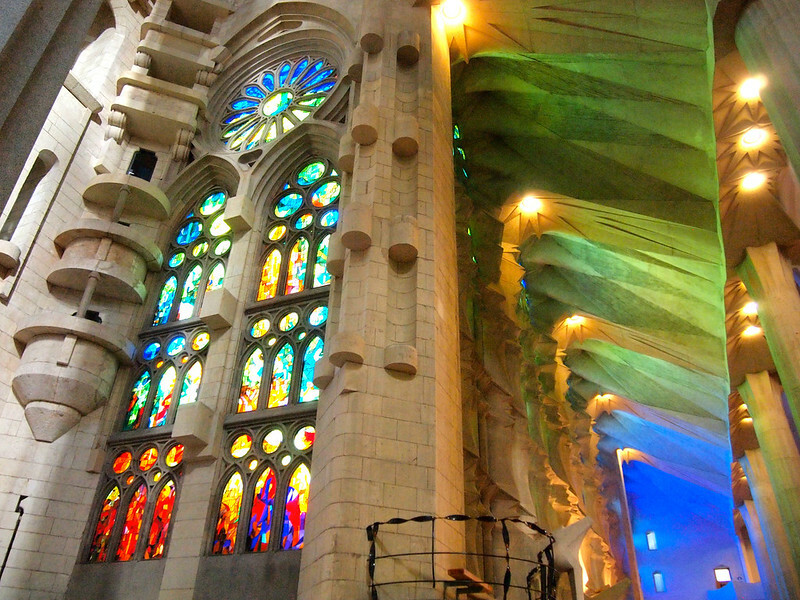 The Sagrada Familia is truly an awe inspiring place to visit when in Spain. They say it will take another 80 years to finish!! I hope it doesn’t take that long! This church is absolutely spectacular! Thank you for the photos. I very much appreciate them being posted. I am many, many thousands of miles away from this church. Occassionally, while in a dream-state, I receive insight and information about places that I have never been to before and I try to find out more about them by the clues that I have received along the way. I would like to know if anyone has ever seen a very large treble clef symbol in this church (that hopefully, shines like gold when light comes through a window or windows) and also is the spiral staircase solid stone, top to bottom ?? What type of lighting is currently used at the base of the staircase and what type of lighting was used there in the past ?? I appreciate any help that anyone may be able to provide. Thank you. I will try to answer some of your questions as a Barcelonian (and as a person who has some family members that have worked in SF for many years). – The spiral staircases (in plural, there are various) are indeed solid stone top to bottom. Gaudi designed SF to be all curved (because straight lines don’t exist in Nature and the temple is designed to reflect it) and as much as possible in stone. Of course, he knew that it would take different generations to build the temple, and it would require different styles. But also different materials and techniques, which would advance along the years. Узнайте про популярный веб портал со статьями про автоматический полив газона.